→ Garbage produced during script execution; memory or WRAM issue? Garbage produced during script execution; memory or WRAM issue? I'm working of a pokered from November 2014 and just gotten back around to tinkering with it again. 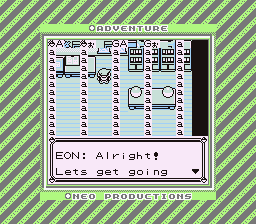 I stopped because I was having issues with my Professor Oak script, at the start of the game: it would essentially glitch out, and none of the Oak scripts would behave, garbage would appear on the screen, the NPCs don't stay pointed in their proper directions, etc. In working on it the last few days, I learned that a tweak I made in WRAM to give me two named spaces for new map CURSCRIPT values was causing a greater share of errors; by commenting these out, the errors occur about 1/3 of the time instead of every time. Additionally, a persistent issue has been the wild pokemon; the 3rd Pokemon on the list appears as a Level 0 instead of their intended value. Any tips for how to run down the issue? Re: Garbage produced during script execution; memory or WRAM issue? I've seen that effect a few times when playing around with Pokemon corruptions. It's probably something going out of bounds and causing a corruption of every five bytes somewhere in wram. You could start by checking with a debugger if trash is being written to the tilemap, and if so, what's causing it to happen. The wild pokemon data corruption is probably due to a similar effect. If you messed up with wram and shifted stuff around, it might only an inconsistency in the save file that will be gone if you start a new game. It looks like it was where I have/had my expanded flags for Pokemon owned & pokemon seen. Something was accessing data that is still hard coded to an address in my version. I moved it around a couple places and presto-change-o both my Oak script and the wild monsters work perfectly. I'm guessing your copy probably still has "wram constants" (It does, unless you've manually removed it, since this was changed in 2015) which are hardcoding various addresses in order to overload values in the middle of other defined structures. Current copies don't have that, so you might want to look at this commit and also this one as well that take care of removing that so you don't have hardcoded addresses accidentally causing issues for you. I will take a look at those; but, I think I nailed the issue: sprites. How many sprites can be on the screen at one time? Because at that point, you have 9: Oak, Rival, Player, 3 Pokemon, 2 Pokedex, and intermittently the girl wandering around Oak's lab. Alright, bug largely fixed: My Oak Error was the number of sprites on screen. I commented out the girl and it works perfectly with my aides placed where I wanted them. This came up in the thread about altering the system to use two ID bytes for Pokemon instead of one; I've rewritten and added tags to my wram, added the larger sram details to the end of my wram file, and updated my save.asm to account for much of this. NOW, I am not holding onto my sprite data on loading a saved file. The new tags and labels look right, the body of the script was copied over (some of the original labels remain so I don't break stuff on my copy), and it compiles, but whenever it loads a game no map sprites are loaded with it. They load into the RAM fine when you re-enter the map, but I tested it in Oak's lab before choosing a monster and all of the scripts still load, trapping the player because the sprites are not there to interact with. Sounds like you made a mistake when copying over changes in the save routine, causing it to not save all of the sprite data. (or potentially, missed something in the loading routine, causing it to not load it when you resume the game) Without seeing your actual changes to see and point out anything specific, all I can say is to go back and double check and make sure you ported everything over properly, and didn't skip anything or make a typo in the process somewhere. I'm using ConTEXT, which has a fun compare feature; I've managed some of these updates by downloading the modern copy and running a file compare and seeing where the actual differences lie. I can post and link my copies of the files (w/sram and save); I didn't know if it had happened often enough someone had a quick answer or not. I'll post those and go back over with a fine tooth comb. Some of the constants will be different; I either adapted it to the constants already in the file with the new code or added them as what amounts to a dual definition. I'll take a look at it and see what I can find. For reference, here is the commit where I fixed save routines. Red++ was forked around the same time yours was, so it is a relevant comparison. You have a SECTION heading in between the wSpriteDataStart and wSpriteDataEnd labels. That section heading in the middle is supposed to be removed or commented out. In looking back over this, I seem to remember having this exact same problem while working on it, and I think that ended up being the cause. I was skimming yours and saw it commented out and started to wonder about that; I'll give that a go! Thanks! No problem, hopefully that takes care of it. If not, well, I'll keep looking. And thar she blows! Works perfectly!! This is nice; getting some solid progress, I had given up after the earlier botched Starter Oak script headaches and a little time off was just what was needed; new eyes :D Thanks for the hand! - The initial corruptions posted about the Oak script stemmed from the sprites in the room: by moving the position of Oak's aides, too many sprites were on screen at one time and overflowed. - The saved file issues stemmed from the SpriteData having the "Section" marker within after I added the SpriteDataStart, SpriteDataEnd markers. No problem, glad to help. And feel free to snoop around in Red++ in the future if you're curious or running into problems with something I might have already fixed. I'm going to roll up the sleeves and dig into yours, but in the mean time I'm seeing another funny memory issue: the items are not saving properly either. I save, reload, and the items are rubbish as well. That I'm more confused about. The way you described it, it sounds less like a new-item related issue and more of a wram or sram issue, like something might still be hardcoded and causing the data to be overwritten or something. Or am I misunderstanding the problem you described? Is it only an issue with your new items, or is it just the pack in general becoming corrupted? Nope, you've got it as-described~ The whole pack is corrupt on reloading the save file. *I* relocated my Pokemon data elsewhere because of the prior issue, but I left a padded set of bytes at the top of the file to accomodate and keep the structure intact as somethings still appear hardcoded, which is what that wild pokemon issue I mentioned above was. So I figure this is an SRAM save issue I would think instead of wram issue like the earlier matters were. Something about the locale of the wPokemonOwned block of flags is important when it comes to storing the item data; relocating my flags back to the top of the MainData block restored the saving of the items as appropriate but restored some sprite errors in scripts and the Level 0 Pokemon in the wild. Adjusting the apparently blank run of bytes just after "wDestinationWarpID" to account for my expanded PokemonOwned etc flags to keep the following addresses "the same" restored the wild 'mon levels and prevented the sprite errors in the scripting. In Red++, I also experienced some issues with lv0 Pokemon in the wild. This was caused by wram_constants.asm still being a thing, causing it to attempt to load the Water Rate in the middle of grass encounter data, setting one of the levels to 0 in the process, among other things. This came from not always remembering to fix the offsets it manually allocated to account for dynamic things that had expanded (in this case, pokedex flags and stuff like that). I'm not really sure why you felt the need to move some of the pokedex flags around instead of keeping them in place and dynamically allocated based on NUM_POKEMON, unless by only being slightly more outdated than mine, yours still has a ton of hardcoded ram addresses somehow or something. I do think there's more hardcoded addresses than I realized~ It is working now, and I'll be sussing more of that out as I go along, but I at least know what the cause is and have a rudimentary fix while I update the files.